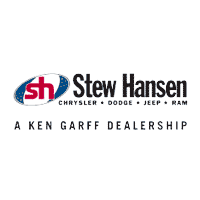 Why Buy A Chrysler Certified Pre-Owned Vehicle From Stew Hansen Dodge Ram Chrysler Jeep, the nation’s largest Chrysler Certified Dealer? We put your new Certified Pre-Owned vehicle through a rigorous 125-point inspection to ensure that your vehicle checks out front to back, inside and out. No vehicle is “Certified” until we are certain that we have satisfied your need to be completely confident, secure and happy. You can purchase with confidence knowing that your vehicle is backed by a factory 7-year/100,000 mile Powertrain Limited Warranty* and a 3-Month/3,000 Mile Maximum Care Coverage**. Learn the story on your vehicle before you purchase. All vehicles come with a complete CARFAX history report. Enjoy a 3 month trial subscription to the Sirius Select package with over 140 channels of programming on equipped vehicles. *Runs 7 years from the date the vehicle was originally sold as new or 100,000 on odometer whichever occurs first. ** Starts on the date of the CPOV sale, or at the expiration of the remaining 3/36 Basic New Vehicle Warranty. Deductible applies, see dealer for details.